Regular Massage is proven to have more profound and longer lasting effects. Moist Heat is used to penetrate oils deep into the body and also to relax and soften tight and congested muscles. Our Express Massage is designed for those individuals that only desire attention on specific areas of the body or for those on a tight schedule. Your session will be tailored to meet your specific needs. Swedish Massage is a very relaxing style of bodywork. It combines oils or lotion with an array of strokes such as rolling, kneading, and percussion to help the body improve its circulation. The benefits of this type of bodywork are wide-ranging and include relief from aches and pains, decreased stress levels in the body, enhanced mental clarity, improved appearance, and greater flexibility. Deep Tissue Massage is a form of bodywork that aims to relieve tension in the deeper layers of tissue in the body.We use various techniques with our hands, knuckles, and elbows and apply focused pressure on “problem areas” or “trigger points” in the body.Deep Tissue Massage is a highly effective method for releasing chronic stress areas due to misalignment, repetitive motions, and past lingering injuries. Due to the nature of the deep tissue work, open communication during the session is crucial to make sure you don’t get too uncomfortable.Keep in mind that soreness is pretty common after the treatment, and that plenty of water should be ingested to aid with the flushing and removal of toxins that will have been released from the deep tissue during the session. Custom Massage is a massage tailored to your specific needs. If you are a person that likes a little deeper pressure than a Relaxing Swedish Massage and maybe a little lighter than a Deep Tissue Massage, then, this is the massage for you. This is the perfect massage for someone wanting only some Therapeutic Massage and the majority, Relaxation Massage. Please be sure to communicate your goals with your therapist to ensure you receive the best massage ever. Sports Massage is a type of massage designed for highly active people who engage in athletics.Engaging in sports is harsh on the body and can often lead to injuries in both the short and long term.Sports Massage enhances performance and prolongs a sports career by helping to prevent injury, reduce pains and swelling in the body, relax the mind, increase flexibility, and dramatically improve recovery rates.Sports Massage is also highly effective in aiding the rapid recovery of an athlete from an injury by encouraging greater kinesthetic awareness and in turn promoting the body’s natural immune system. Enjoy a Soothing Couples Massage side-by-side with your partner in a cozy environment! Perfect for husband-wife, mother-daughter, or two friends that want to experience Paradise together! 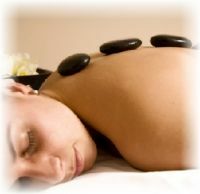 Stone Massage is a type of bodywork that uses deep penetrating heat from specialized stones. Stone Therapy delivers a profound expansion and contraction inside your circulatory system, improving the function of your lymphatic and immune systems, and enhancing your body’s self-healing mechanisms. This style of bodywork takes you into deep states of relaxation, releasing stress and anxiety, detoxifying the body, and balancing your nervous system. Himalayan Salt Stone Massage™ is an innovative healing technique using warm salt crystal stones to ground and balance the body’s electromagnetic field, central nervous system and meridians. Salt crystals from an ancient primal sea beneath the Himalayan Mountains are hand-carved into massage stones that gently soothe away an accumulation of stress, tension and pollutants. Bring the mind, body and spirit, into balance with a Salt Stone Massage. Trigger Point Massage is a gentle style of bodywork that focuses on stimulating and releasing “trigger points” in your body.Trigger points are tender areas of tension similar to acupressure points, except they occur in the belly of the muscle tissue rather than along the energy pathways of the body.These ‘knots’ are built up throughout a person’s life due to physical, mental, and/or emotional stress.During a session, focused pressure is applied through a variety of techniques in order to release your trigger points.This process can be quite painful at times, yet the effects are lasting and profoundly transformative. Lymphatic Drainage Massage aims to gently and rhythmically move the lymph through the body, especially swollen areas of the body, relieving pressure and enhancing the functioning of the immune system.As both a preventative and remedial technique, MLD can be used for a wide range of purposes including faster recovery from injury, reduction of swelling and discomfort from pregnancy, and strengthened resistance to illness. 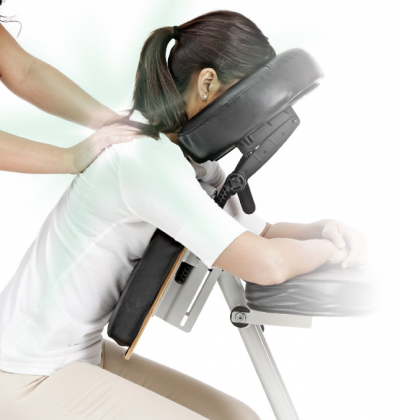 Chair Massage incorporates advanced therapy techniques and is performed with your clothes on sitting in a specifically designed massage chair. The effects will stimulate and increase the blood and oxygen levels of your soft tissue. The results may include stress relief, pain relief, increased energy, increased stamina, immune support, lymphatic support and many other benefits your body will love. Cupping therapy is an ancient form of alternative medicine in which a therapist puts special cups on your skin for a few minutes to create suction. This style of therapy is used for many purposes, including to help with pain, inflammation, blood flow, relaxation and well-being, and as a type of deep-tissue massage. Thai Yoga Massage combines passive yoga-like stretching with gentle pressure along your body’s natural energy lines to increase flexibility, relieve muscle tension, and enhance your overall well-being. The session is performed on a special mat on the floor, leaving you with a deeply nourished, relaxed and energized feeling.Be sure to wear comfortable clothing that will allow for a full range of motion during the stretches. Got Aches? Got Pains? BAT Therapy Can Help! BAT Therapy is a type of massage therapy that is designed to release ones "Body Armor" which is the buildup of tension, stress and postural imbalances that cause our bodies to be In Pain and Out of Whack. Accidents, injuries, repetitive daily motions, work postures, driving and many other reasons will create many layers of "Body Armor" within our bodies. Once the body can release this "Body Armor", we get a chance to move and feel better. Fluidity of motion returns and aches and pains may disappear. The capacity to do things that we used to do comes back into focus and the quality of life gets better as we become happier and more fulfilled. "Body Armoring" can be explained as a chronic pattern of involuntary tension in our body that restricts our range of motion and body movements. It may block or suppress blood flow, nerve communication and emotional expression. It can also change how we interpret situations and effects our awareness of life itself. "Body Armoring" is also a defense against the expression of feelings or emotions in order to protect ourselves from hurt, pain or discomfort. Here at Paradise Spa, we have specifically trained therapists that can facilitate the Transition of "Body Armoring" using a technique called BAT Therapy. BAT Therapy Sessions are 30 minutes and are focused on very specific areas of the body depending on your personal Armoring. A release will be felt after just one session, however, a series of 5 or more may be needed to release the Armoring built up from your entire life experiences. Dan's the Man: Therapy that lasts. I was in tears. The pain in my back and neck was so bad. Two car accidents and falling off horses as a child had taken its toll. DAN TO THE RESCUE! Dan's unique therapy gets right to the root of the problem, and now I'm pain free at last! Dan has over 3 decades of experience as a masseur, and during that time he developed his unique therapy that irreversibly heals chronic pain. We live with painful tightness which he stretches to release stagnation. Once released, you are free to enjoy your body again. I highly recommend Dan's Body Armour Therapy, (BAT), if you need to finally solve your miserable aches and pains once and for all. - Ginger G.